Dumplings in Bamboo Leaves. Made with glutinous rice, chicken meat, Chinese mushrooms, dried shrimps, dried chestnuts wrapped in bamboo leaves. Clean and soak glutinous rice for about 30 minutes. Remove and drain. Cut chicken into small pieces (each about 25 g). Season the chicken chunks for about 30 minutes. Soak and remove stems from mushrooms and cut into thick strips. Boil the dried chestnuts in boiling water for about 10 minutes. Remove and rinse with fresh water to get rid of the coats and cut each into half. Soak and remove the shells from the dried shrimps and fry with some oil. Boil the bamboo leaves with suitable amount of boiling water for a while. Remove and clean for use. Heat pan with 4 tbsp of oil. Add in the glutinous rice to fry over slow flame. Add in more (during frying, about 12 tbsp of oil will be used). Then add in 2 tbsp salt, 2 tbsp fine sugar, 2 tbsp light soya sauce, 3 tbsp black soya sauce, 1 tbsp sesame oil, some pepper powder and stir well (the total frying time is about 10 minutes). 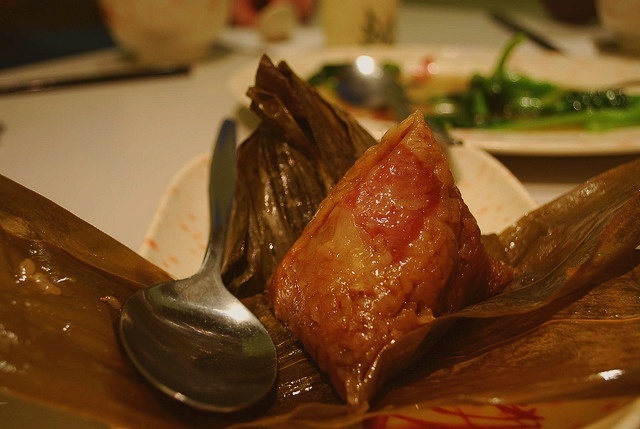 Arrange bamboo leaf into hollow, put in half of a portion well-fried glutinous rice and add in one piece of chicken, some chestnuts, dried shrimps, mushrooms, cover the stuffing with the other half portion of glutinous rice and wrap in into a 4 angle-shaped dumpling. After wrapping, boil the dumplings for about 4 hours. looks yummy! great post. Excellent recipe! Will try this dumpling this weekend. Thank you chef! You are welcome sir. Feel free to review this recipe. Cheers!